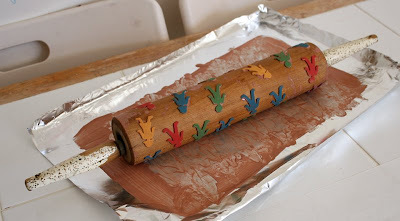 One of my RSS feeds turned up a cool tutorial on print making with a rolling pin from Craft Chi. 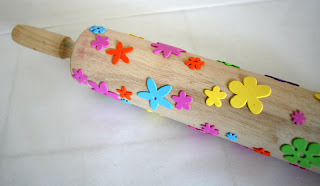 I thought it was a really great idea, so that evening went and got a couple of old rolling pins from the local Goodwill. 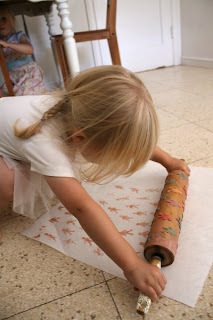 T he next day me and the kids stuck a load of those little foam shape stickers all over the rolling pins. We got the self adhesive flower ones from the Dollar Tree and the self adhesive little people from the dollar section in Target. 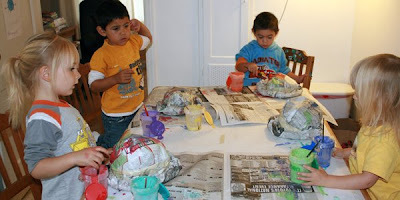 Next we mixed up some kiddy paint that was watered down a little with a tiny bit of liquid dish soap added. Poured the paint on a sheet of aluminium foil and rolled the pins in it until they were coated evenly in paint. 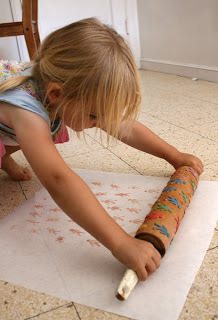 Then the girls took turns rolling the pins over some brown paper and some butchers block paper we had handy. 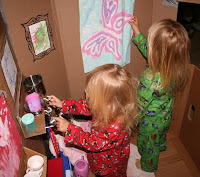 I was surprised at how easily they were able to manage it by themselves being only two and three years old, and they were fascinated by the patterns coming out. 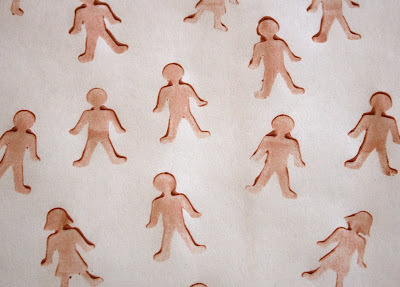 When the little people papers were dry we decorated the people by adding hair and faces and clothes to them. 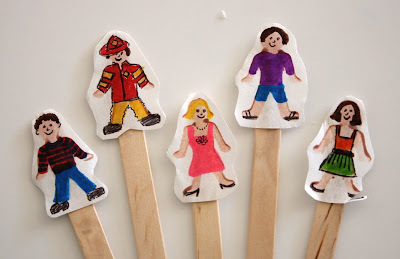 We cut out our favourite ones and glued them to lollypop sticks to make cute little puppets. 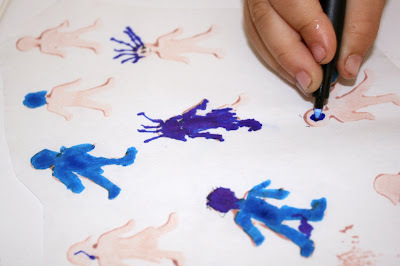 I'd love to do this with slightly older kids and mix up a load of different skin tones, print pages of people of all races and then decorate them in the national costumes from various countries. 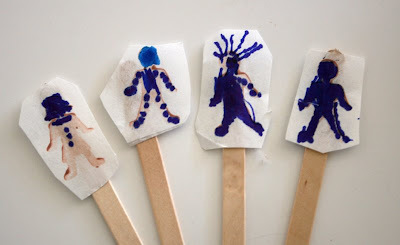 Here are a few I did for the kids to play with while they were busy making thiers. Phew, this is a long post isn't it! 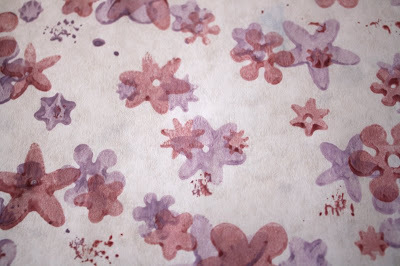 Here are a few of the flower prints too. 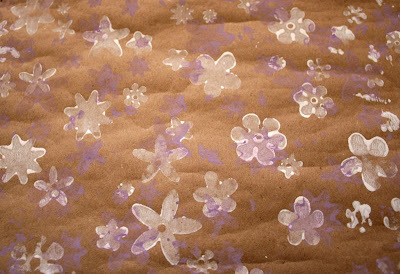 I think we are going to use them for wrapping paper. 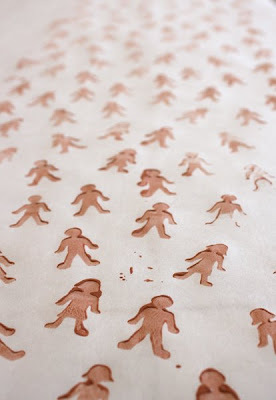 A couple of weeks ago I came across a great blog called Pepper Paints. 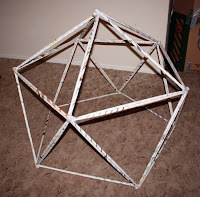 One of the projects on there uses rolled up tubes of newspaper to make a pretty sturdy structure from triangles. 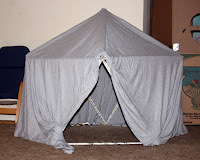 Couldn't resist trying it out and it was a great success with the kids and the resulting bedouin tent goes quite well with the melon box shantytown that's already in the livingroom. 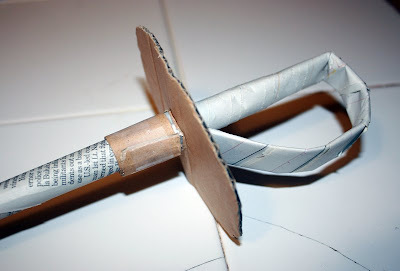 Whilst we were rolling up all those tubes I thought to myself that they might make quite nifty pirate rapier type swords (kids are going through a pirate phase right now), so I taped the end of one back on itself and slid on an oval of cardboard with a hole in it, then taped on a little strip of card at the bottom of the blade to hold the guard in place. 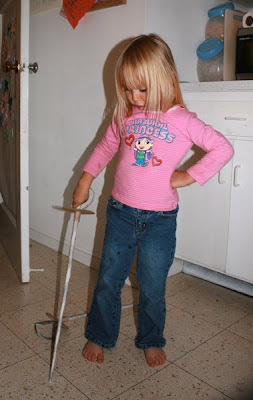 They seem to work rather well in that they have stood up to a fair bit of battling without falling to bits and yet the kids have been unable to seriously maim each other with them, because if you hit too hard then the paper blade just buckles and because the paper is rolled on the diagonal, the end of the sword isnt many layers of paper and so you can't really poke anyone hard with it either. I like them because they look really cute though. 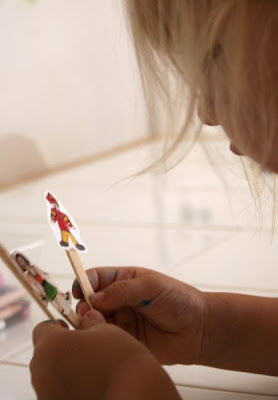 I came across a neat little craft project on Mayamade the other day, which showed how to make quick, easy and quite durable hats for kids out of newspaper and a strip of tape. 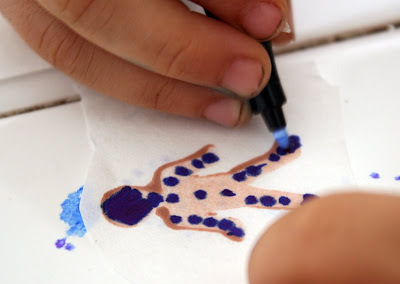 We had a go at this today with seven preschoolers and they all really got a kick out of it. Each hat was made by plonking broadsheet newspaper, three sheets thick on a kid's head and then taping around thier forehead to make the bowl shape of the hat and then rolling up the brim and scrunching it in place. You'll need some wet wipes for the newsprinty faces that come out from the hat fitting proceedure. 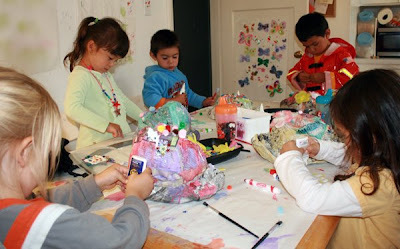 The kids painted their hats and then when they had dried, decorated them with all sort of stick on bits and bobs that we had lying around, including some flowers from a dollar store lei that had broken. 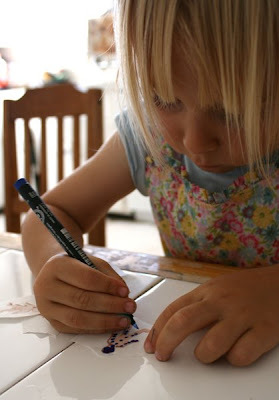 This would be great fun as a craft activity at a little girl's birthday tea party. 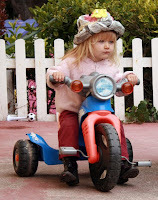 I couldn't stop giggling because my youngest looked like a crazy old lady in her hat. We made a trip to Costco the other night and managed to squish a deconstructed watermelon box and three huge sheets of cardboard that were between layers of cans on the pallets there into our lickle car, along with the whole family and our purchases. It was a tad claustrophobic on the way home, but it isn't far. 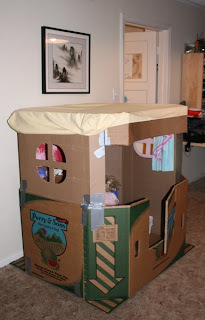 When we got home and the kids had gone to bed I set about fashioning a wendy house out of it all. 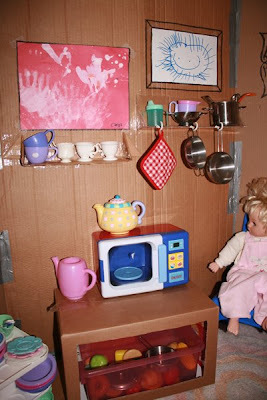 For the cost of a roll of gaffer tape the kids woke up to a wendy house with doors, windows, shelves, their artwork framed on the walls and it looked quite cute after we'd put all the teaset/toy microwave/baby dolls/bath mat rugs and some other random stuff in there. The roof was just one of those elasticated crib sheets that are like mini fitted sheets, so I didn't have to tape it on or anything. 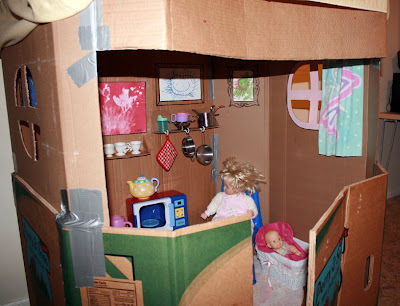 All in all it was quite easy to put together, very cheap and only took one person one evening to do and now it looks like we have a shanty town in our livingroom, which is classy. My kids just love playing with water. 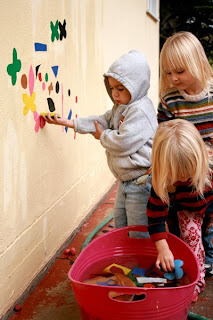 It can be the bath tub, the pool, the beach, a plastic box full and mermaid toy, puddles, sprinklers anything, so I'm always looking for crafts that can involve water and preferably outside. 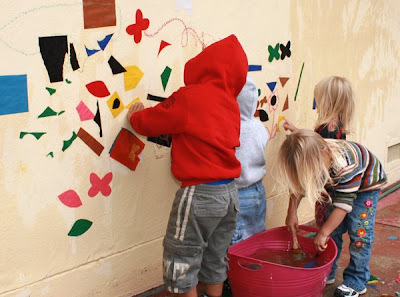 For this one we hosed down the side of the house and cut up a load of shapes out of coloured construction paper, then let the kids dip the paper in a bucket of water and stick them to the wet wall. The pieces stick until they dry and then they fall off, so you can use them again and again if they don't blow away. I think next time we'll try cutting up some of our junk mail to add to the collage. They drew on some sidewalk chalk too and that hosed off without leaving any marks and because the wall was wet the chalk colours were much brighter. 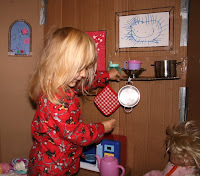 This blog is for all my friends with preschoolers and all my kid's friends who are preschoolers. I hope you find some inspiration or at least a chuckle or two from reading about our forrays into messy mayhem. It seems a shame that I have to say this, but it appears that it is required. Please do not use any of my images or writing without contacting me for permission. I am completely happy for people to write about things that they have seen on this blog and link back to us, but reproducing my photographs and text without permission or credit is unacceptable. The man that I am affiliated with also has a blog. He loves to make stuff with and for our kids as well. His domain is more in the realms of electronics, but he makes other stuff too. Check out his electronic fangling over at Fangletronics. If you'd like to send an email, you can contact me and my wizards at "filthwizardry at gmail dot com." I have three little girls. A five year old, a six year old and a brand new teeny baby. They are the inspiration for this blog.